Up to now the corporate media has kept us distracted with titlation, celebrity and other inane stories; for it was social media that led to these pictures going viral and the media then just had to pick up the story. 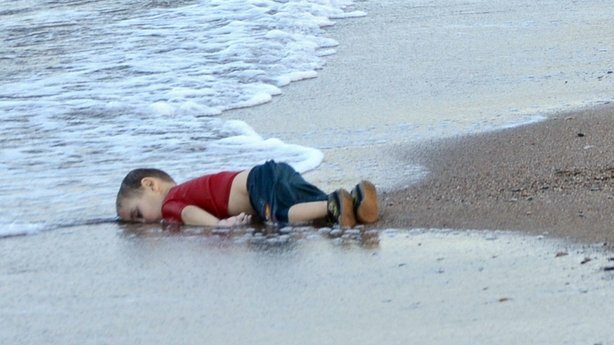 Previous to that, thousands have already drowned this year alone in the Mediterranean Sea fleeing from Libya -bombed out by NATO, and other war torn countries like Iraq and Afghanistan where Western powers dropped their democracy inducing bombs, invaded and occupied for over a decade, tortured people (Abu Ghraib anyone? ), ran night raids terrorizing and murdering thousands, formented civil war, armed warlords and so forth. It is funny how we hear about all these conflicts and consider them remote and happening to others while the life of middle class consumerism continues but in fact we are vaguely aware of it in our sub-conscious and it disturbs us greatly when we are forced to focus on it to actually pay attention to reality. We know that we should be doing something but content ourselves with the fact that our lives are just too busy to allow us to do anything about it. Neverthless at the height of this crisis before the Russians stepped in, it was the ISIS jihadists who were firmly center stage in the news and were the target witha rising chorus, to send a force to Syria to remove them, but this is simply another justification for war and hides the fact that previous attempts over the last 3+ years by the Gulf States primarly Saudi Arabia and Qatar and by the US, UK, France and Turkey, have failed at regime change despite the fact that they are 100% responsible for formenting the war and financing, training, arming and sending in thousands of mercenaries and jihadists extremists. And this means they are responsible for the wave of refugees and deaths such as Aylan Kurdi. So the narrative was that ISIS are so bad and out of control which is true, that they need to send in the troops. In other words they have previously failed to swing public opinion to commit a full scale assault and hopefully this can do it. This is what all the beheadings were about in the last year and destruction of some of humanity's greatest archaeological treasures was for and firmly aimed at the Western middle classes. Again though this has changed since the Russians started bombing ISIS and caught the Western powers by surprise and ruined their narrative at least to those paying attention. When one looks there is quite a lot of evidence for who backs ISIS. First off, lets start with a Defense Intelligence Agency (DIA) Aug 2012 report recently declassifed that Judical Watch managed to obtain through a FOIA request. The report was widely circulated through the US government. The report points out that the key event in the rise of ISIS was the corresponding rise of the insurgency in Syria which the USA with its allies fully supported. It confirms that reactionaries dominated the opposition from early on. 1. The creates the ideal atmosphere for AQI to return to return to its old pockets in Mosul and Ramadi, and will provide a renewed momentum under the presumption of unifying the Jihad among Sunni Iraq and Syria, and the rest of the Sunnis in the Arab workd against what it considers one enemy, the dissenters. [Islamic State in Iraq] ISI could also declare an Islamic State through its union with other terrorist organizations in Iraq and Syria, which will create grave danger in regards to unifying Iraq and the protection of its terrority. And this is what more or less happened. In June 2014 a few thousand ISIS fighters took over the northern Iraq city of Mosul with a population of 2.5 million and gained access to the oil revenues and at the same time looted a few hundred million dollars from the bank and picked up a vast amount of weaponry provided by the US to the Iraqi army. 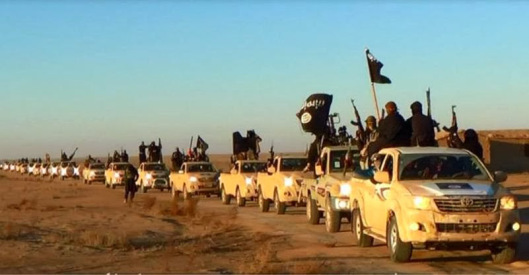 Around this time there was lots of media coverage showing ISIS in fleets of Toyota trucks advancing on different areas. Yet how come the US didn't attack them? The US had their famous 'turkey' shoot after the first Gulf War on the road from Kuwait to Iraq where they massacred the retreating Iraqi army. So why didn't they attack these very visible convoys? They rendition people from all over the planet to Guantanamo and other secret detention sites, and launch drone attacks in other countries like Afghanistan and Pakistan which even the US admits has killed over 2,000 civilans so far in the form of colateral damage -all to kill a few Al Qaeda leader -assuming they really did. Their radar and signals intercept satellites can pick up all movements and radio signals in vast areas and would be particularly focused on the entire Middle East -yet they were claim they were surprised. The whole episode looks more like tacit support by virtue of not intervening. Last Monday, a senior lawmaker disclosed that Iraq’s army had shot down two British planes as they were carrying weapons for the ISIL terrorists in Al-Anbar province. “The Iraqi Parliament’s National Security and Defense Committee has access to the photos of both planes that are British and have crashed while they were carrying weapons for the ISIL,” al-Zameli said, according to a Monday report of the Arabic-language information center of the Islamic Supreme Council of Iraq. When we consider other aspects of ISIS like the fact that they are said to be excellent at social media and regularly use Facebook and Twitter to get their messages out, we have to wonder how the powerful NSA and cyber army of the US seems unable to close down their websites. They do it very quickly and easily when people are breaking copyright, or downloading free music. Likewise we are told ISIS are well financed and rich. So how come their banks accounts and assets aren't frozen? They managed to do this quite easily against Gadaffi at the time and recently against a range of Russia oligarchs with regard to the sanctions there. Moving onto the arming of the "resistance" in Syria the evidence is much more in the open about the Gulf states' and Western backing of those fighting Assad and when it became increasingly clear the only 'Syrian resistance' was ISIS, the US media then pushed the line that it was US allies (-i.e. not the USA itself) supporting them. In Sep 2014 General Dempsey told the Senate Armed Services committee that their "Arab allies" were funding ISIS. Later in Oct 2014 Vice President Joe Biden publicly criticized US allies again for backing ISIS. Biden even apologized to Turkey and the United Arab Emirates for saying Middle Eastern allies are partly to blame for the strengthening of ISIS. At an appearance (Oct 2014) at Harvard University, he said the militant Islamist group had been inadvertently strengthened by actions allies took to help opposition groups fighting against Syrian President Bashar al-Assad. "They poured hundreds of millions of dollars and thousands of tons of weapons into anyone who would fight against Assad. Except that the people who were being supplied were al-Nusra and al Qaeda and the extremist elements of Jihadis coming from other parts of the world," Biden said. You don't just hand over millions of dollars and tonnes of weapons to anybody. If you try and claim on the social welfare for alot less you are checked and cross checked and have to make multiple verifications as to who you actually are. You also have to wonder why Biden came out in public and said this. It suggests that different factions of the elite in the US empire are at odds at how things should be happening. And yet the narrative they tried to push that their allies do thing outside of their control is not right either. It is said that Saudi regime can't take a pee without the US say so as they are joined at the hip. Without the US protection and security, the royals in Saudi would be overthrown in weeks if not days. To help those still in doubt, an ISIS leader, Abu Atheer in 2013 stated: "We have good relations with our brothers in the FSA," and said ISIS bought anti-aircraft missiles and anti-tank weapons from the FSA. Reports say that Britain's MI6 cooperated with the CIA on this weapons rat-line to Syria. Indeed it has been suggested that all the Jihadists going to Syria over the last year or two from Britain were helped in their efforts by the MI6 despite the media scare stories horrified that this was happening and clamouring for more police and surveillance powers. To spell it out, the British state uses the angry young Muslem men in Britain to put in the meat grinder to promote extremism and carry out terrorism abroad and at the very same time to scare the home population into accepting more draconian powers and ratcheting up of the police state. This is all about controlling the folks at home. You need to be made scared and confused all the time. What's even better for the neo-liberal capitalist system is that the waves of refugees and immigrants are the perfect tool for driving down labour costs and undermining working conditions and rights. It's a win-win. 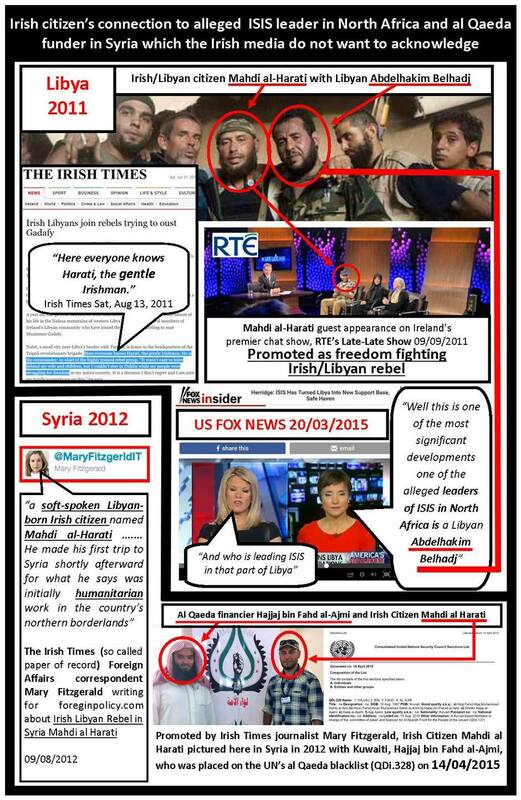 The Independent in June 2014 reported Birmingham MP Khalid Mahmood saying at least 1,500 Britons, if not more, have joined the terrorist-led jihad in Syria and Iraq , rejecting the 400 figure handed out by Hague, and 500 such jihadis referred to by U.K.’s anti-terror chief Sir Peter Fahy . “I imagine 1,500 certainly would be the lower end. If you look across the whole of the country, there’s been a number of people going across,” Mahmood said. Does anyone think there is no mosque in Britain that is not under surveillance? For yet more coverage of how Western powers are backing the ISIS terrorists in Syria see this report from the Guardian in 2013. Notice how it is always couched in terms of helping moderates even though it should be absolutely clear there aren't any and the various governments and intelligence agencies know that too. Western training of Syrian rebels is under way in Jordan in an effort to strengthen secular elements in the opposition as a bulwark against Islamic extremism, and to begin building security forces to maintain order in the event of Bashar al-Assad's fall. Jordanian security sources say the training effort is led by the US, but involves British and French instructors. The UK Ministry of Defence denied any British soldiers were providing direct military training to the rebels, though a small number of personnel, including special forces teams, have been in the country training the Jordanian military. But the Guardian has been told that UK intelligence teams are giving the rebels logistical and other advice in some form. British officials have made it clear that they believe new EU rules have now given the UK the green light to start providing military training for rebel fighters with the aim of containing the spread of chaos and extremism in areas outside the Syrian regime's control. According to European and Jordanian sources the western training in Jordan has been going on since last year and is focused on senior Syrian army officers who defected. "As is normal, before any major decision is taken on this issue, the preparations are made so that when that decision is taken, everything is in place for it to go smoothly. That is what these groups [special forces] do. They go in in advance," a European diplomat said. Reading between the lines, it is clear they have been blatantly training, arming and providing intelligence to the terrorists, which would include locations and movements of Assad's Syrian army. The sentence about maintain order in the event of Bashar al-Assad's fall is a laugh because if we check with what happened in Libya, it has gone from the African country with the highest standard of living and tolerance to a completely failed state, with infrastructure built over decades destroyed, and over-run with marauding gangs of Jihadists and criminals who have murdered literally tens of thousands since Gadaffi's fall. For another angle on this, the former Iraqi Prime Minister Nouri al-Maliki warned that the war in Syria could engulf Iraq, yet the United States and its allies kept supporting the insurgency. The American bombing of ISIS, relatively light and sporadic, has only intensified the belief of many Iraqis that the United States doesn’t want to defeat the group. Maliki has been publicly accusing Saudi Arabia and Qatar of funding ISIS for months. He also blamed both countries for launching Syria's three-year civil war through al Qaeda-linked groups that now operate on both sides of the Iraqi-Syrian border, next to Anbar province. ..Documents and flash drives seized during the Sayyaf raid reportedly revealed links “so clear” and “undeniable” between Turkey and ISIS “that they could end up having profound policy implications for the relationship between us and Ankara,” a senior western official familiar with the captured intelligence told the Guardian. ...In November, a former ISIS member told Newsweek that the group was essentially given free reign by Turkey’s army. Ankara had begun to address the problem in earnest — ..when an ISIS-affiliated suicide bomber killed 32 activists in Turkey’s southeast on July 20. The Free Syrian Army (FSA) is a terrorist organization responsible for indiscriminate killings, imposition of sharia law, murders, rapes, cannibalism and more. Even one of the FSA commanders, Bassel Idriss, recently admitted to openly collaborating with ISIS and al-Nusra, revealing yet another example of the fact that the “moderate rebels” are not moderate at all. Salem Idriss, one of the men seen in the photograph with John McCain, is the commander of the FSA, the “opposition group” touted as a “moderate rebels.” In reality, of course, the FSA is nothing of the sort. However as the rebels gained strength, the reports of war crimes and atrocities that they were committing began to create a bit of a public relations problem for Washington. It then became standard policy to insist that U.S. support was only being given to what they referred to as "moderate" rebel forces. This distinction, however, had no basis in reality. Reuters had reported in 2012 that the FSA's command was dominated by Islamic extremists, and the New York Times had reported that same year that the majority of the weapons that Washington were sending into Syria was ending up in the hands Jihadists. And the FSA's ties to Al-Nusra are just the beginning. In June of 2014 Al-Nusra merged with ISIS at the border between Iraq and Syria. So to review, the FSA is working with Al-Nusra, Al-Nusra is working with ISIS, and the U.S. has been sending money and weapons to the FSA even though they've known since 2012 that most of these weapons were ending up in the hands of extremists but even that is too gentle a conclusion because as we know and cited above, they have been doing weapons and food drops directly to ISIS. 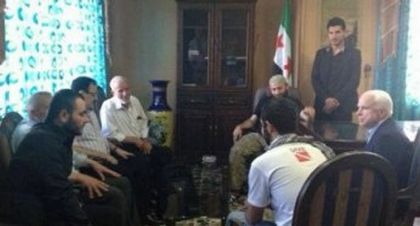 In April 2013 former presidential candidate John McCain made an illegal visit to Syria and had a meeting in a rebel safe house with the heads of the "Free Syrian Army" in Idlib, Syria. Present was the top Al Qaeda terrorist leader Ibrahim al-Badri (aka Al-Baghdadi of ISIS, aka Caliph Ibrahim of the recently founded Islamic Empire) demonstrating the farce that is the so called War on Terror. We have to let the magnitude and significance of this sink in. This is the same group the American army were 'hunting' down in Iraq, the key brand name in the 14 year War on Terror but really War of Terror by the US and it's allies on Arab and Middle East states. n the left foreground, top al Qaeda terrorist leader Ibrahim al-Badri (aka Al-Baghdadi of ISIS, aka Caliph Ibrahim of the recently founded Islamic Empire) with whom the Senator is talking. Behind Badri is visible Brigadier General Salim Idris (with glasses), the former military chief of the FSA, who has since fled to the Gulf states after the collapse of any semblance of the FSA. The meeting and photograph also demonstrates that the FSA and ISIS are very very close and largely one and the same and underscores that supplying arms and support to the FSA is effectively supporting ISIS. Even if they were truly separate, the very fact that you are arming one faction, diverts Assads forces away from dealing with ISIS and takes the pressure off them and thereby allowing them to advance and take over territory and of course to carry out their butchery. 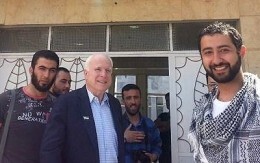 The New York times attempted to run a story to deny the visit and claim it was rumors, but the only other offering in the way of McCain’s defense is a statement by his own Communications Director, Brian Rogers, who claims that the man in the picture was not Baghdadi but another individual associated with the Northern Storm Brigade, ironically a terrorist organization in its own right. Northern Storm was famous for kidnapping a group of religious pilgrims crossing through Syria in September, 2012. Nevertheless, the comparisons of the photographs and the individuals in them lean toward the idea that the terrorist in the picture is Baghdadi. Regardless of who it was, the individual was a terrorist since McCain’s defense is that it was a fighter/commander with Northern Storm. It should also be remembered that McCain traveled to Libya during the assault against Ghaddafi in order to meet with terrorists in that country and promote the barbarism which they would ultimately bring. It should be noted that McCain is extremely close to the color revolution apparatus organization, the International Republican Institute, a wing of the National Endowment for Democracy and USAID. He is the current Chairman of the IRI. It Was All Planned Years Ago. There are still more sides to this story because all this mayhem was planned years ago. For those who don't know, U.S. General Wesley Clark was Supreme Allied Commander Europe of NATO from 1997 to 2000. In an interview with Amy Goodman on March 2, 2007, Clark (Ret. ), explains that the Bush Administration planned (in 2001) to take out 7 countries in 5 years: Iraq, Syria, Lebanon, Libya, Somalia, Sudan and Iran. -See here It has all taken a little longer than expected but it is making good progress. Here is the latest update. Iran - The final stage. And it will be loud. . So it should be quite clear that the current wave of refugees to Europe is directly as a result of the actions of the sponsors of terrorism in Syria. While the numbers are trying to enter Europe are in the hundreds of thousands, there are in fact several million in the countries directly bordering Syria. It is likely that the poorest are in places like Lebanon and Turkey while the ones reaching Europe had more money to pay the traffickers. The ideal solution is that the war would end and resources could be made available to rebuild the country and people's lives but this is not likely to pan out. So far the refugee crisis is causing all sorts of political problems in Europe. Germany had said it will take 850,000 and Sweden expects to accommodate around 190,000 by the end of the year. For a country like Sweden this is a huge number and even for Germany too and one can only conclude that this is going to greatly fan the flames of the far right. The Left in general seems to take the approach that we should let everyone in and it will all be fine but it won't. Nor do the Left say an awful lot about who has caused all the butchery or make any real effort at trying to understand what is going on. The Left simply play the role assigned to them. In the Libyan war they were fooled and thereby helped with the pretext for the justification for the NATO bombing of Libya. Then again in the Syrian war, they were fooled for a while into believing the FSA were Left wing rebels and again enabled the pretend game. And now in this instance by just reacting and not analysing and controlling their own narrative, they instead allow the mainstream media to get away with the lies that the refugees are the result of Assad. They are not. They are the result of terrorism. We also have to step back and see what is the bigger picture. For instance, Ulrich Grillo, the boss of Germany’s heavy industry and obviously a capitalist not a leftist, has welcomed the refugees. Why you would wonder? -because big business has profited from the occasion to abolish the minimum wage in several German federal states and is getting a huge influx of cheap labour. This is and will cause resentment from the German population. There has been suggestions that this was planned up to a year in advance primarily with President Erdoğan of Turkey who controls the 'valve' and therefore the flow of refugees from Syria through Turkey and onwards to Europe via the Balkans. Erdoğan in the last few weeks has managed to extract a promise of several billion euros from the EU to deal with refugees on Turkish soil. In this article Who is twitter-luring refugees to Germany? the author cites a study that shows the bulk of tweets inviting refugees to Germany and welcoming came not from the Germans but an army of bots operating from UK, USA and Australia. What exactly then is going on and what is the effect on Syria? It looks like the action by Erdoğan to readily accept refugees from Syria on the one hand and allow them to pass through Turkey to Europe is essentially an exercise to drain Syria of it's people and thereby dismantle the country. As more people leave and remember it is more likely to be the young, it tends to reinforce itself and trigger more to leave. These are the very people that are needed to both defend the country and rebuild it. And this crisis comes out a time when the efforts to topple Assad have failed and they are probably running out of fighters. The logic is that they terrorists sponsors will tap into the flood of refugees to recruit, arm and send back in a new fresh wave of bodies to the war. Traditionally refugees have been widely used for this sort of thing in all conflicts. For the European side of the equation the benefit for the USA which after all is really the boss amongst the sponsors of this awful war (i.e. Saudi, Qatar, Turkey, France, Britain) is that if they can create enough problems in Europe it bogs them down and stops any reapproachment with Russia. For the US who incidentally fund 70% of the NATO budget, the role of NATO in Europe is one of occupation and control in the military and foreign policy sphere and America only remains strong so long as others are weaker. The geography of Europe and Russia would suggest that they should form a natural alliance and strong trading relationship, but if this was to occur, then combined an independent economic region extending from Europe into Russia would be far stronger than the USA. This can never be allowed to happen and the Ukraine war is part of the poison to disallow that. But so too must the present crisis be related to it, especially when you consider the vast majority of refugees are heading to Germany. The Covert Origins of ISIS? Why does France want to overthrow the Syrian Arab Republic ? from their mysterious leaders, whoever they may be! "Mahdi al-Harati led the Al Qaeda brigade who besieged the Rixos Hotel in Tripoli in August 2011. According to Khamis Gaddafi, he was overseen by French instructors. According to a high-level foreign military source, NATO had given al-Harati the assignment of capturing the Libyan leaders who sheltered in a secret facility of the hotel, and of murdering former congressman and Martin Luther King assistant, Walter Fauntroy, who was staying in the hotel. He was also to eliminate twoVoltaire Network collaborators, Thierry Meyssan and Mahdi Darius Nazemroaya, who were based at the Radisson Hotel, whence al-Harati operated his torture center. This decision had been made at a meeting restricted to the NATO command in Naples a few days earlier. The meeting minutes mentioned the presence of Alain Juppé. When questioned, his secretariat denied any involvement by the French Foreign Minister, saying that he was on vacation at that time. According to a high-level foreign military source, NATO gave al-Harati the assignment of capturing the Libyan leaders who sheltered in a secret facility of the hotel, and of murdering former congressman and Martin Luther King assistant, Walter Fauntroy, who was staying in the hotel. Just in....pictures have emerged of theTurkish president's son Bilal, -the same person who is instrumental in the selling of ISIS stolen oil, -where he is seen dining with the leaders of the terrorists organisations ISIS and Al Nursa. These are the groups who have butchered thousands of people, are the prime cause of the wave of refugees fleeing Syria, and the same group responsible for the destruction of some of the greatest archaelogical treasures. President Erogans son, Bilal Circled Center, with Leaders of ISIS and Nasra. Identity of man on the right unknown. How do the NATO states that bomb Syria hope to defeat IS if NATO member Turkey is actively aiding that enemy?